Our feet carry all the weight of our bodies. Heel spur (also known as plantar fasciitis) is the result of stretching and tearing of the tissue along the bottom of the foot (the plantar fascia). Excessive wear and tear to the plantar fascia of the foot often results in this type of running injury. It is a common condition among athletes, particularly runners. On this page I will explain what this injury is, how you can treat it, which products you need to use and how you can prevent it. 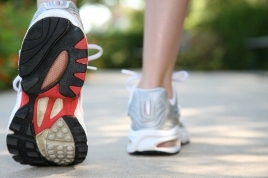 What is Heel Spur / Plantar Fasciitis ? You may also experience swelling of the heel area. How do runners get Heel Spur / Plantar Fasciitis ? Your plantar fascia works like a shock-absorber and supports the arch in your foot. If tension becomes too much, it causes small tears in the fascia. Repetitive stretching and tearing can cause the fascia to become irritated or inflamed. This running injury is very common in runners, whether you do long distance, middle distance or you are a sprinter. Especially long hours of training, no warming up or cooling down or a sudden increase in workload can trigger the pain. But as an occassional jogger or walker you may also be at risk of placing too much stress on your heel bone and the soft tissue attached to it. Treatment is often a slow process. Treatment includes applying cold compresses, strapping and taping and, of course, and you don't want to hear it, ... rest. Anti-inflammatories such as aspirin and ibuprofen can be used to relieve pain and inflammation and studies have shown some benefits from glucosamine. Corticosteroid injections give longer relief but a local aesthetic is often required before hand. Wearing shoes with good arch support is highly recommended. So avoid sandals, flip flops, etc. Keeping the foot in a dorsi-flexed position with help of a night splint (see picture) during the night has shown benefits and early morning pain can be reduced by stretching the achilles tendon and calf muscles before rising. Surgical treatment is always a last resort as it can lead to complications including ongoing problems with arches and or compression of the cuboid bone. There are some products available which can help in the battle against plantar fasciitis. A good choice is the heel spur kit which offers a few necessary products together at a discount. I'll briefly discuss each of the products. 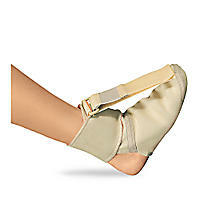 The curved heel spur arch brace makes sure that the tissue along the bottom of the foot gets extra support. It lifts the plantar fascia, thereby providing relief from inflammation and pain. You can wear them all day long for that much needed relief and cure of heel spur. Very easily adjustable with two hooks. You can speed up the healing process with this soft slim-fitting night splint. You can use it overnight to stretch the plantar fascia. The Thermoskin keeps the skin warm which helps stretch out the plantar fascia. You can adjust the dorsal flexion (amount of tension) to pull back toes toward the ankle. 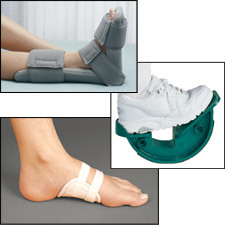 The heel spur kit combines the night splint, the arch brace and the step stretch. The step stretch helps you stretch your foot. It relieves many types of foot pain like plantar fasciitis, achilles tendonitis, ankle strain, arch pain and chronic foot conditions. The HTP Heel Seats work to quickly relieve pain by applying acupressure directly beneath the pain hot spots. By using the clinically proven healing methods, they not only cure the actual disorders, but also work to prevent any future heel pain like plantar fasciitis. The Heel Seats, made from KRATON, are washable and extremely durable for long-term use. You can wear them to slow down and even reverse the effects that aging has had on your heels. You can speed up your healing with HTP Plantar FXT. It pulls the toes back slightly, stretching the plantar fascia so it may heal. You can wear it during the day while seated. It comes with a nonslip bottom that will help you prevent slipping. The new HTP Gel Heel Seats are a perfect fit for any sufferer of plantar fasciitis or heel spurs. They can reverse your plantar fasciitis, heel spurs and other heel pain disorders; relieving pain, treating your condition and preventing future pain outbreaks. Suffering from heel spurs? Then really consider the HTP Gel Heel Seats. All of the above are good products. The heel spur kit is a great choice, because it offers three products at a discount and the HTP Gel Heel Seats seem to be very popular. The risk of this running injury can be considerably lessened by ensuring you discard old running shoes before they stop supporting and cushioning your feet. Make it a rule to buy new shoes after about 400-600 miles of use. Remember, when doing your stretches after running, to pay particular attention to your feet, making sure to stretch your feet, Achilles tendon and calf muscles. The risk to a runner�s feet and legs are always higher than those in other sports and heel spur is just another problem to contend with. But when you do your stretches and everything else in your running training makes sense, then the chances that you get heel spur can be dramatically reduced. Also check out the heel pain page which talks about some more heel injuries. Wish to learn more about running training and injuries ?